Powered by the salesman-turned-mayor Lastman's grandiose dreams, North York's city centre appeared almost overnight, with escalators connecting tower heights to subterranean transport depths; it was as if Jacob’s angels descending and ascending between Heaven and earth had unexpectedly touched down in this suburban strip. The all-encompassing design was to meet residents’ every conceivable need, yet the place memory contained in the heritage home / museum remained, along with other imaginative and provisional activities in the crevices between the condominiums. The Oh Dear! projects hinge what now is with what then was. Like the toy version of the divine ladder in which blocks appear to eternally cascade downward, it unfolds the city centre’s static monumentality by revealing some of its lost and hidden meanings. Between Sheppard and Finch avenues north of the 401 high-rises appear suddenly, hiding a view of the North York city centre until the last moment. However, if your windows are down you can hear “Mel’s Bells”, named after city father Mel Lastman, ring out the time from the sky-scraping bell tower. As you lift your eyes upward you wonder how this regional hub was successfully anchored on the edge of massive arterial traffic. The answer is that it draws from the underground human stream of the Yonge subway line, filtering it upward into multi-use complexes. However, dependence on the extension of underground transit for North York’s development has been a long-standing source of resentment against the City of Toronto. 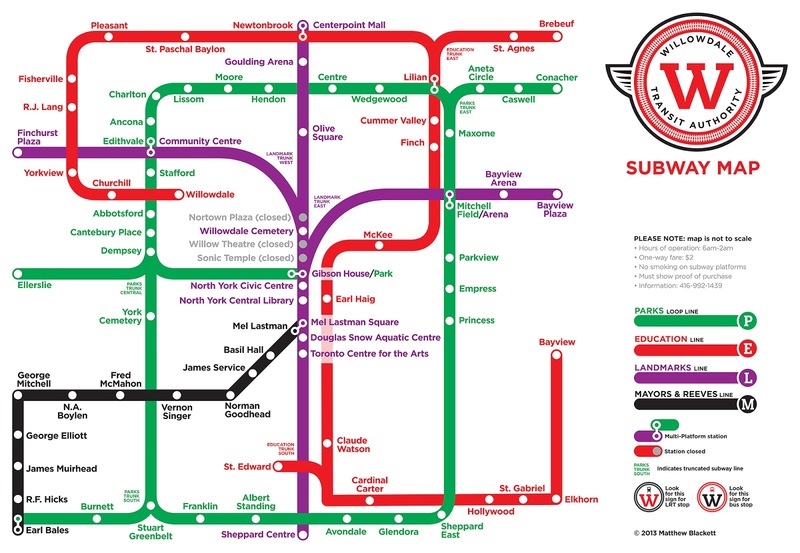 Matthew Blackett’s Willowdale Transit Authority, (near the subway entrance within the complex named the North York City Centre), is a map of a hypothetical subway that proposes an alternative articulation to this most central and affluent area of North York. A self-contained system, it dedicates separate lines to each category of Willowdale’s amenities, assets, monuments and even political grandees that shaped its current form. A subversive take on infrastructure, Willowdale Transit Authority fondly satirizes the metropolitan dreams of a former suburban borough. 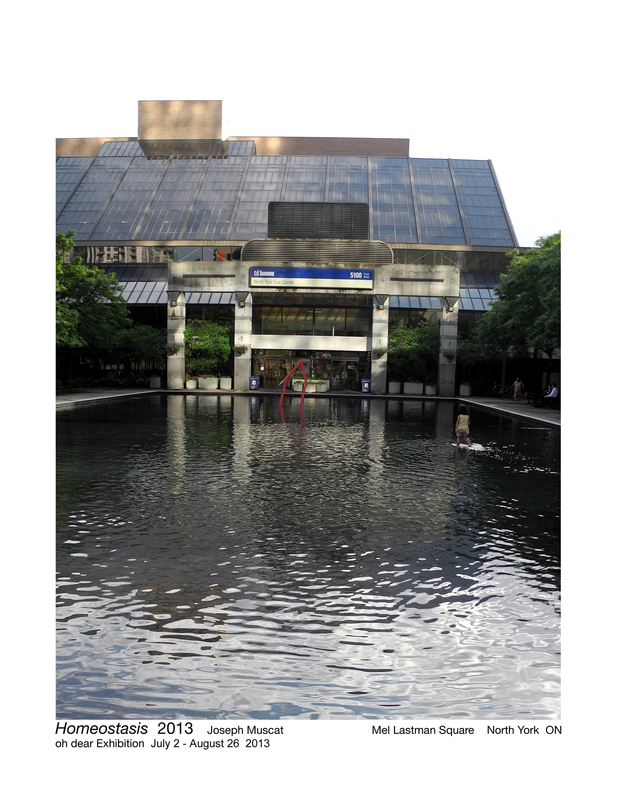 Up at street level, Mel Lastman Square features a watercourse flanked by wide paths and steps leading down to a reflective pool at the entrance of the former city hall now called the North York Civic Centre. Joseph Muscat’s Homeostasis temporarily rests in the pool. It is the final note in the Square’s sliding scale that powers down the monumental surroundings to create a space for human interaction. The playful form of Homeostasis invites you to turn it over in your mind as it transforms from different sight-lines. From one angle it resembles a child’s first drawings of a house. And yet, it is tilted and as you shift perspective the symbol collapses. Appearing both concave and convex the work capriciously morphs as you walk around it. Images of the flicking of cards in a dealer’s hands or a delicately balanced house of cards come to mind as Homeostasis evokes the high stakes of real estate in the surrounding affluent residential area. The prevalence of luxury condominium towers and “monster” homes side by side with modest postwar houses signal the loss of a standard scale of domestic life that has come with the widening income gap. Enter the Civic Centre at the entrance beyond the reflective pool. Turn to your left and take the stairs up to the ground floor. The former city hall now houses offices for citizens’ groups and district services. There is a constant passage of people using it as an interior walkway from the adjacent North York City Centre to nearby offices, parking lots, streets and parks. 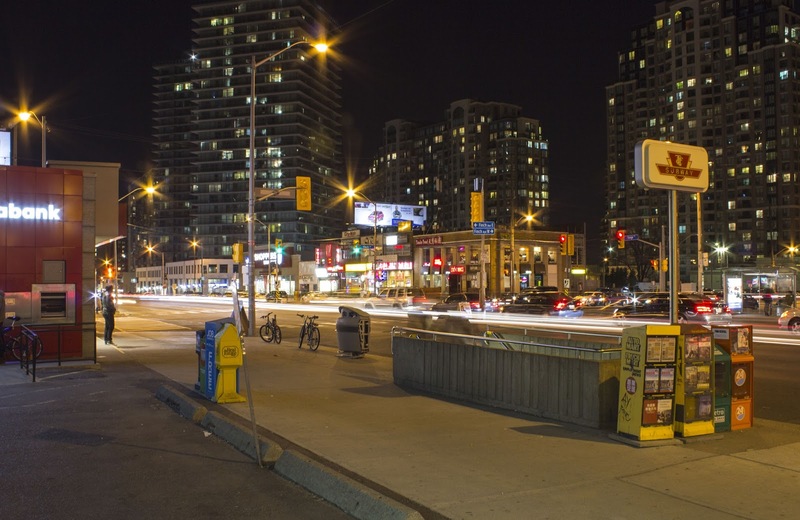 At the Civic Centre’s south entrance are two large photographic prints—one taken by day, the other by night—of the high-density development on nearby Yonge Street. Rare Earth, a work by Ian Chodikoff, refers to minerals essential in the manufacture of mobile phones. Foreign students and recent immigrants rely heavily on these devices that make round-the-clock global communication possible. 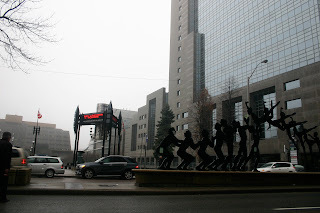 Chodikoff’s cityscape shows what you see on leaving Finch subway station. Emerging from underground you are deeply disoriented in a new location. You struggle to get your bearings and memorize landmarks. Unfortunately this strip of Yonge Street seems particularly anonymous, especially by night—it could be any urban place on the planet. Paradoxically, the homesick students enrolled in the numerous ESL schools on the street may feel at home in this “anywhere” landscape. They, along with office workers and condo residents, are served by sidewalk cafes offering franchise international fast food. This commercial strip, a vestige of Willowdale’s main street, now houses many new window front businesses that turn-over quickly as entrepreneurs get their footing in a new culture. The mobile phone, made possible by rare earths, is an elemental ingredient for life to thrive here. 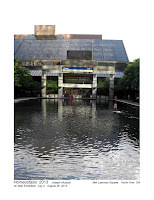 Leave the Civic Centre through the south doors and cross to the Toronto Centre for the Arts. 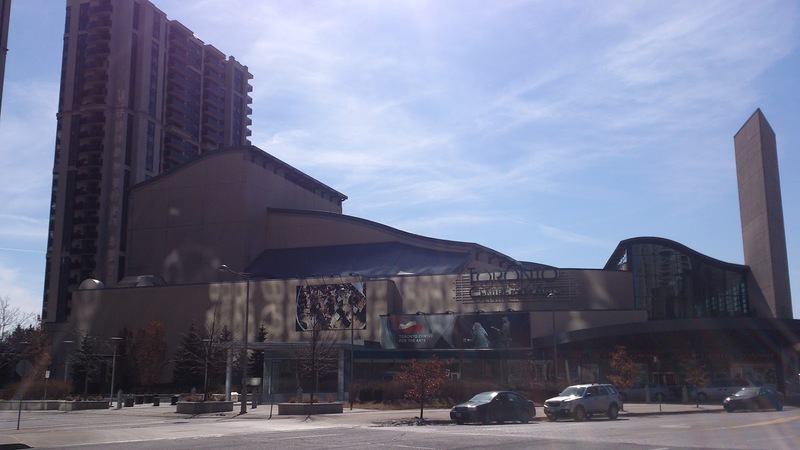 The former North York Performing Arts Centre was built in 1993 when mega-musicals were at the peak of popularity. Garth Drabinsky’s production company, Livent, was contracted by North York Council to operate the theatre complex in 1994 but four years later the company was bankrupt. Another production company took over but was defeated by the plunging market for Broadway shows. Enter the screening salon, just beyond the ticket windows. Otino Corsano’s North York, 2013 presents three videos edited in the style of television commercials. The richly layered soundtrack from the headphones enhances the intimacy and poetry of the worlds created by different artists. These subtle productions are whispers that have replaced the booming notes of musical theatre. The recorded gestures, artistic and mundane, celebrate habitual activities that make North York environments a stage. Cross the street at the lights on North York Blvd. 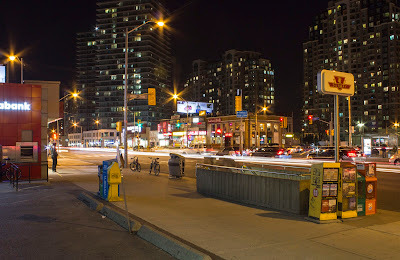 Head north up Yonge Street and turn right on Empress Avenue. Cross to the east sidewalk and continue north on Doris to Parkview Avenue. 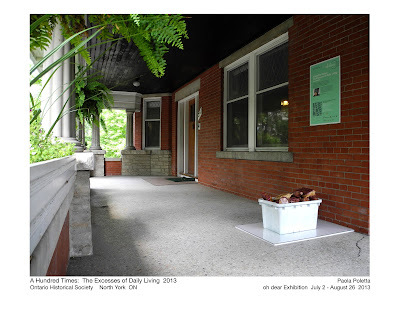 The porch of the historic John McKenzie house, headquarters of the Ontario Historical Society, is the site of Paola Poletto’s a hundred times, the excesses of daily living. This red brick home was built a hundred years ago on a fragment of the owner’s farm. Sold to create a residential subdivision, the only clues to the past existence of a farm are several outbuildings behind this house, parent to the surrounding Empress Subdivision homes. The extension of the radial railway line out of Toronto spurred settlement in the subdivision just before the First World War. In the space of the porch, objects accumulate before they are put in their proper places; it is a service area where discarded packaging is sorted, possibly appraised for use as up-cycled craft material or put out on the curb. The city-issued “blue box” is a familiar unit of measure representing the hypothetical amount of recyclable material a household produces for weekly pick-up. On the John MacKenzie house porch a recycling box, painted white to draw attention to its unusual contents, holds containers from what the artist served to her family. Pick one up and examine it closely; each discard has been customized through a labour-intensive embellishment. Local lore has it that the nitrogen-rich soil of Willowdale makes for vibrant yellow roses, yet in a hundred times… the rose petals have faded to a delicate brown-tinged pale hue. 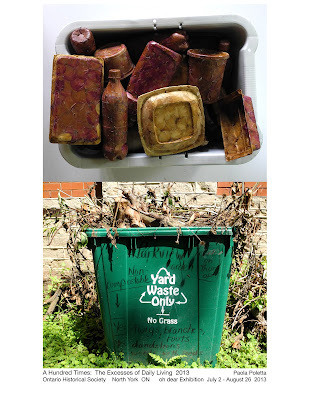 The artist has subverted the mass-produced iconic shapes of the food containers, covering them with faded organic membranes by hand. There is a deliberate scrambling of opposites: inside and out, surface and form, preservative receptacle and organic matter. The accumulated containers are a diary of comfort or drudgery-filled meals. Merging with the refuse of other homes in the Ganges River of matter that ends in the recycling stations, the act of filling of the blue box translates a private into a public gesture of nourishment, conversion and renewal. Head back to Yonge Street, go south to Empress Avenue and cross to the west sidewalk of Yonge Street. Go north through the covered hoarding that marks the edge of a construction site, turn left at the sign for Gibson House, walk through the lane and turn to examine the hoarding directly in front of the historic house-museum. Like the half-completed behind-the-curtain set-change, this grouping of apartment buildings, historic house, and condominium construction site has the drama of elements caught in a transitional state. The window-shuttered farmhouse holds the memory of Willowdale’s rural roots. But it is also a look-out: from its windows and its front lawn, past and present are set in a fresh dialogue through the works of Bailey Govier and Stephen Cruise. Govier’s multi-part installation Home Economics explores the peculiar boundaries and countervailing forces of this site. Her painting on the construction fence can best be appreciated from the front lawn of Gibson House. On the flat surface the three-dimensional shape of towers is created in three point perspective by the angle of lines. Whether the thin diagonal lines atop the towers are pushing them off balance or keeping them upright by pulling them together is an open question. Their bases are cut off in the picture plane, giving the viewer a sense of being poised to fall into the sky. These dynamic optical effects contrast with the weighty stability of the half-way constructed condominium visible above the fence. Yet high up in the cat walks workers, along with local residents below, might relate to the strain of keeping balance in a constantly shifting environment. In the parlour of this circa 1850’s farmhouse and upstairs on a wall beside a bedroom, Govier’s paintings improvise on the warping of time in the space between the interior and exterior of the window. 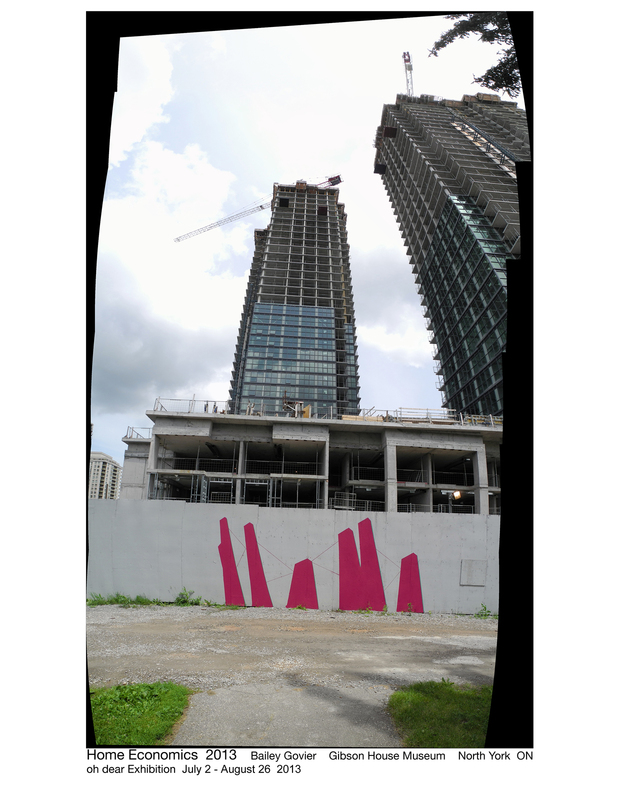 The push-pull between illusion of depth and the reality of line on flat canvas echoes the pivoting between past and not-yet-visible future that is playing out in this confusingly changeful corner of the North York hub. Cruise’s Willow BOX is a mysterious apparition on the Gibson House lawn. Willow Dale was the name of the postal station located here and serving a widespread rural area. Covered in a tree bark pattern, the mysterious object has a shape similar to that of a mailbox, but Canada Post situates these on public sidewalks and Gibson House has lost its connection to public pathways and service routes. Severed from its surrounding streets by high-rises on all sides, this container of history is recessed both by its retrospective function and its stranded location. 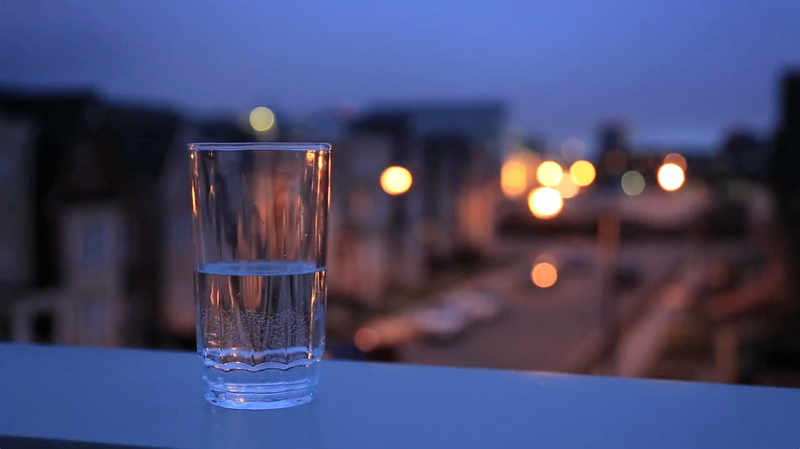 However, the isolation helps in switching into a reflective state of mind. By walking around the house and observing details or through discussion with the costumed staff you may be taken back to an earlier moment that you yourself experienced in the history of the neighbourhood or it may remind you of your first vivid impressions on your arrival here. Join the discussion. Write your thoughts on an Oh Dear postcard. Put it in the metal box on the front of Willow BOX or a companion box in the North York Central Library. They will get to the project’s artists, writers and public and add to the layers of stories that make-up the history of this place. Teresa Casas is a specialist in contemporary art in heritage settings. She has worked in such historic sites/art venues as the Freud Museum, London, The Power Plant, Toronto and Oakville Galleries, Oakville. She is currently writing about rural heritage and urban farmers’ markets as well as helping to set up the Regent Park farmers market in the heart of this re-developed community. Visit Back to the Park for her work on the history of Toronto parks. What do you like about your neighbourhood? How is North York unique, special, or different? Tell us what you think about Mark Warrack's walk into the past and how your personal memories can give us even more colourful insights. … Yonge Street was a very different place. The road was only two lanes in each direction, with wide sidewalks on either side. There wasn't a single structure over two stories high. There was almost a village-like 'Main Street' feel to Yonge Street. 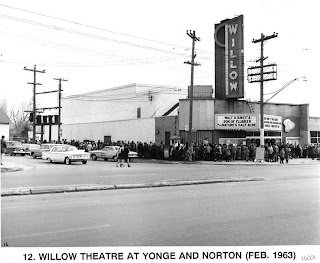 There was a local movie theatre -- only 25 cents on Saturday afternoons…. 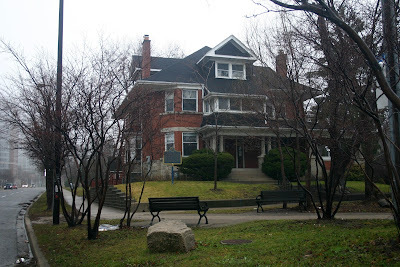 Willowdale – that was the name of the Canada Post mark and address of received mail. The phone number of everyone I knew began with the numbers, 221 – pronounced “Baldwin 1”. We never used an area code and everybody had a party line. A private phone line was pretty much just for businesses. I grew up on Hillcrest Ave., in the fifties and sixties, in the second block from Yonge Street. At the west end of the block was Doris Avenue and home to our family doctor. His office was immediately next door in a plain, unassuming building to the north, which still remains. Behind the Doctor’s house and his office was an open field that led downhill to the creek and beyond. Today this area is flat, filled in with no sense of a hill or open creek as there once was. I recall sitting in the Doctor’s examining room looking out the window to the fields outside as if you were out in the country. On the east side of Hillcrest across from the Doctor’s house was a single residence which remains, then open fields east past the creek. The sense of space and remnants of open grassy fields left over from the former farmers’ fields was our favourite play area. To have fields and a creek only half a block away was a whole natural world just seconds from our house. It’s just about impossible to imagine today what that first block east of Yonge Street was like. There were no sidewalks; the paved street came to a soft edge with gently rolling ditches to either side. Over the street was a natural canopy, formed in a high arch from the mature trees that lined the street. Imagine a green tunnel instead of the canyon of high condo towers. Hillcrest ran through Doris Ave., a simple two lane road, not cut off as it is today. The independently designed homes were set back from the street edge, green lawns, stone walkways, and flowering bushes. There was a sense of place walking this stretch with fine, well designed homes, built in the years before WWII. They weren't overly large homes, but there was elegance, sense of style and individuality. It wasn't a subdivision. Each home was distinct and well-spaced from one to another. Not a one remains. Gladys Allison Place did not exist. Doris Avenue, like the other streets in the area was tree covered, narrow and houses on both sides. Yonge Street was a very different place. The road was only two lanes in each direction, with wide sidewalks on either side. There wasn't a single structure over two storeys high. There was almost a village-like ‘Main Street’ feel to Yonge Street. There was a local movie theatre – only 25 cents on Saturday afternoons; a bowling alley which in the late sixties became DeBoer’s furniture store; a small family run hardware store with wide plank wooden floors, a long wooden counter, and an elderly proprietor with wire rimmed glasses, white shirt and a sweater - Do these wonderful stores still exist? ; and a drive-in Dairy Queen with the big ice cream cone display out at the street. At least a Dairy Queen still exists on the same site today, but not the former drive-in of the 1950s. 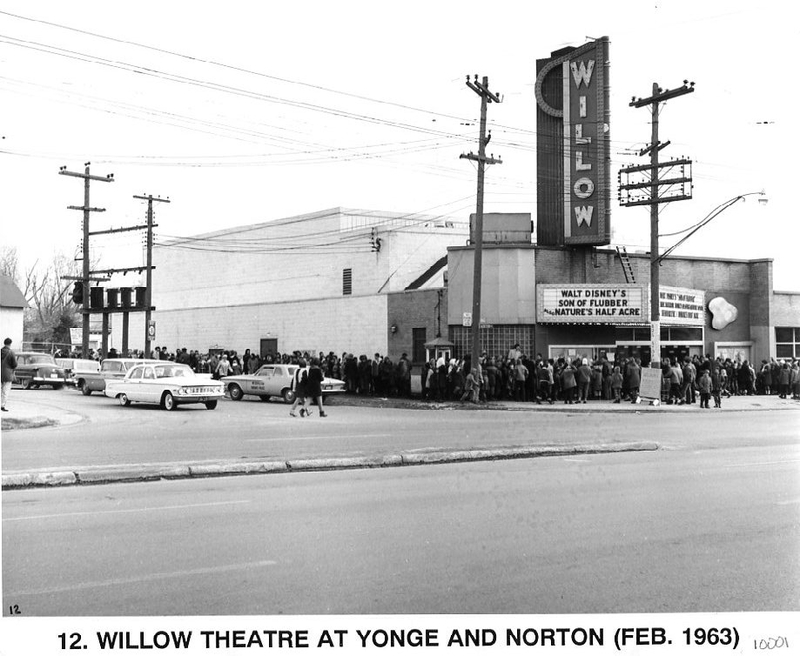 On the northeast corner of Hillcrest and Yonge was a gas station. Like many gas stations of the era it was finished in white enamelled panels. Next door was the local fire hall. The fire station was set back from the street, a red brick structure with two large bays for the two trucks, a tall tower, and easily visible from the sidewalk was the shiny brass pole that the fireman slid down when the sirens blew. Across from the fire hall on the west side of Yonge Street were the municipal buildings, in the same location where Mel Lastman Square and the North York Civic Centre are today. The buildings were set well back from Yonge with an expansive green lawn out to the street. It is good to see that today this area has kept the tradition of open space, yet in a very different design and hard surface form. The municipal building or town hall was fairly simple and not very large. Next door was the indoor municipal pool where every kid in the area learned to swim. It was compulsory in Grade 5 that each student took swimming lessons. The water was always cold. Across the lawn from the municipal building at right angles to Yonge Street was the local public library. This was a beautiful 60’s modernist structure with a white wave canopy on the south side. Libraries were as much a community asset in those days as they are today. To the south of the municipal offices was the wide open green space of York Cemetery. Until the area was developed in the late 70s, the cemetery gates sat out at Yonge Street. Beecroft Road did not go through, but stopped on either side of the cemetery property. When the area was developed the stone pillars and gates were moved back to the west side of Beecroft Road where they remain today. The cemetery was a playground for the local kids with acres of open space and twisty roads to ride your bike. It never occurred to me as a child that someday the cemetery would take on a whole new meaning when my father was buried there in 1975. Just north of Parkhome Drive and west of Yonge Street was an old abandoned brick house. The large deserted house and the surrounding, unkempt, aging orchard provided hours of intrigue and adventure for the local kids. We would spend hours in and around this mysterious place, always a bit creepy and scary. It was eventually reclaimed by the municipality and was brought to new life as the Gibson House Museum. A very different kind of learning centre than it was in the 60s. In the old days, as it were, Doris Avenue, which began at Sheppard, dead ended at Parkview Avenue. The street had to end as there was a lovely, stately home at its terminus that sat upon a slight rise overlooking the street, extensive gardens and grounds and small creek to the west. I had no idea who lived in this house, but it was recognized as the local mansion, always well maintained and obviously stood out from all the other homes in the area. Today it is known as the McKenzie House. Someone asked me recently if I have ever thought of moving back to Willowdale, the home of my youth. I quickly replied, “No” The area of my youth is no longer there. A sincere thank you goes out to the North York Historical Society, the Toronto Archives and the Toronto Public Library for supporting this project. 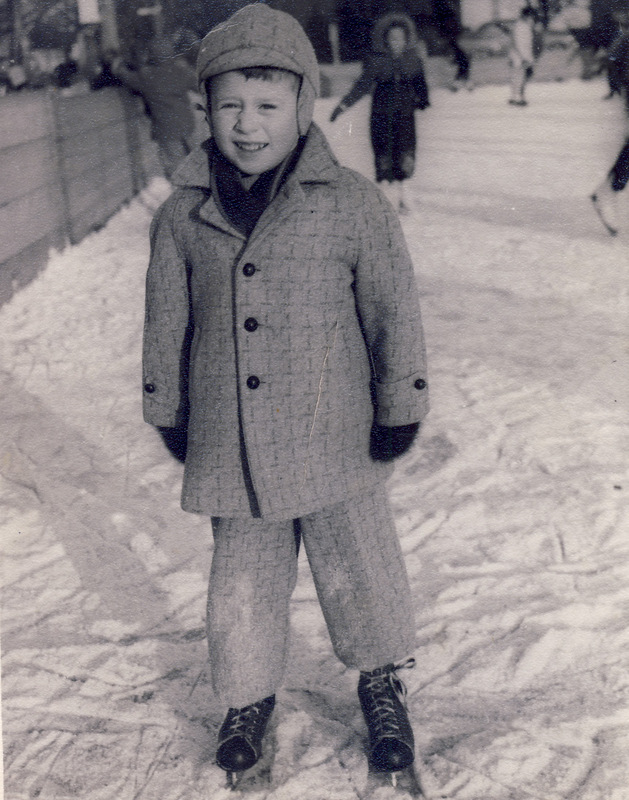 Mark lived on Hillcrest Avenue, Willowdale, for his first twenty years. After two years at York University he headed west and graduated in archaeology from the University of Calgary. Having spent nine years working full time as an archaeologist Mark drifted into the museum world for several years as a curator and educational programmer, eventually acting for six months as a Museum Advisor for the Ontario Ministry of Culture, Tourism and Recreation. For the past twenty-four years Mark has been the Senior Heritage Coordinator for the City of Mississauga. Other than a recent two year secondment at the Ontario Heritage Trust, Mark has overseen the identification, preservation and conservation of Mississauga’s cultural heritage assets. Outside of the working world Mark continues to volunteer with his local residents association. He is also a founder member of the Building Storeys photography exhibits, sponsored by Heritage Toronto, where Mark is an active member of the Board. This year is the 100th anniversary of the John McKenzie House, a large three-storey structure on property deeded to Joseph Cummer in 1801. Early on, a portion of the property was sold to Philip McKenzie, an English immigrant trained as a carpenter and casket maker. He ran a farm that was eventually taken over by his son, John. In1812, John McKenzie subdivided the farm and registered the "Empress Subdivision". One hundred years ago, the surrounding area thus embarked on a transformation from a rural village to a suburban community. The house today is the headquarters of the Ontario Historical Society. The grounds host a marvelous community garden that lends a visible presence of the area's agrarian heritage. Of particular acclaim is Willowdale's nitrogen rich soil, which gives roses a brighter hue. a hundred times: the excesses of daily living memorializes the daily refuse of take out food and grocery store purchases that accumulate as plastic containers in my family's blue and green recycling boxes. The collection boxes are painted over gallery white; containers for art. 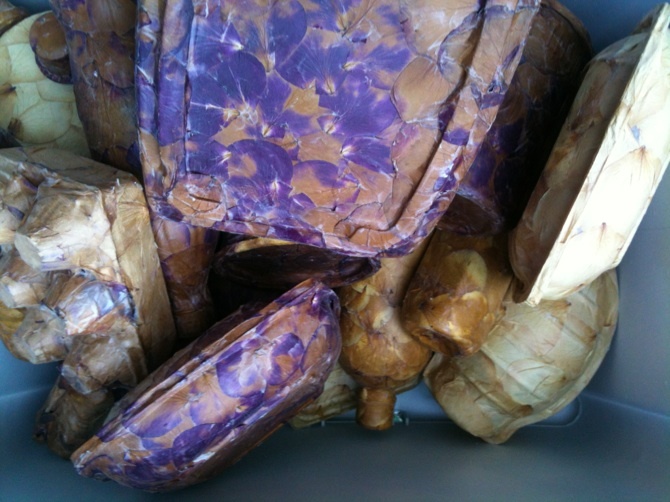 Covered with rose petals, these empty, locally sourced food containers and drink bottles assume a false sense of weightiness, accomplishment and craftiness. 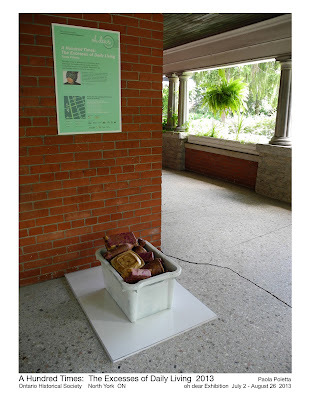 This installation is located on the porch of the John McKenzie House. Visit any time between July 2- August 26, 2013. Thanks to the Ontario Historical Society for hosting this installation. 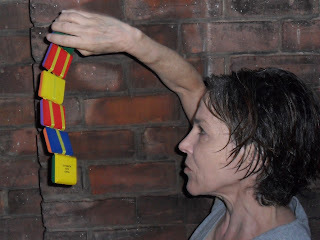 Paola Poletto is an artist, writer and arts administrator. 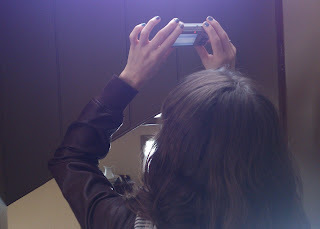 She is artist coordinator of Oh Dear (2013), Tel-talk (Tightrope Books, 2012) Boredom Fighters! (Tightrope Books, 2008), Ourtopias: Cities and the Role of Design (Riverside Architectural Press, 2008); and co-founder/editor of a lit-art zine called Kiss Machine (2000-5), which included a girls and guns issue with traveling exhibition to artist run centres in Ontario, followed by a tour through Eastern Europe. In 2009, Paola was guest curator of fashion no-no, an show that intersected design, craft and new technologies (Queens Quay Gallery, Harbourfront Centre), and from 2000-8 was director of digifest, an annual new media festival produced by Design Exchange in collaboration with Ontario Science Centre and Harbourfront Centre. Paola's work involves a lot of people with a whole bunch of viewpoints, much like the Surrealists did, and the occasional solitary retreat into cheap aesthetics and craft-based objects. Her latest object making endeavor is StudioPeePee. 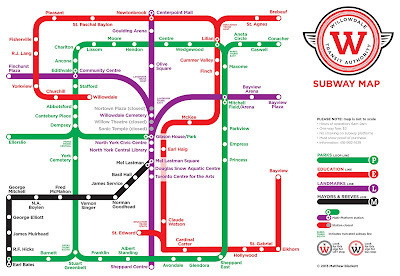 It operates out of North York and has largely inspired the Oh Dear project. Maquette by Joseph Muscat, 2013. My obsession with the image of the cabin, a minimalist representation of a house, began 32 years ago while still a student at OCAD. I was drawn to this simple isometric form for reasons unknown to me at the time but which became clearer with the passage of time. In 1997, I took a trip to Moosonnee aboard the Polar Bear Express. In twenty-four hours I was transported from the frantic crowds of Union Station to the remote dirt roads of this James Bay outpost. On the way to and from Moosonnee, I passed hundreds of these remote one room cabins splayed among the trees of the boreal forests and low brush bush. These ubiquitous cabins, with their smoking chimneys suddenly took on a different meaning. It was a déja-vue followed by an Aha! moment which made a long lasting impression on my image repertoire ever since. I have drawn and painted, photographed, made prints of and constructed this icon throughout my entire career. When the call for the Oh Dear project arrived, I immediately thought of my cabin. A number of house motif ideas instantly popped into my head; my choice to work with this depiction was quick and easy and for obvious reasons. As Curator Paola Poletto outlined in her Call for Submission, her intent to organize a show by North York Artists in North York on the subject of housing and mobility in this suburban enclave seemed to fit perfectly with my artistic preoccupation and building history in North York. The open leaning skeletal structure consisting of a façade, a roof, and a side wall and stabilized by a floor base will stand in the middle of the shallow water pool in Mel Lastman Square. The sculpture embodies my long history of living and working in this Yonge and Sheppard neighbourhood. Besides the symbolic implications I attach to this image, I now know that my family’s uprooting from my native Malta during my teen years and settling in Toronto must have also been an influential factor. For the first time, my family owned a home and this feeling of security and comfort offered me the opportunity to later own my very own house and studio, bring up a family, teach and be conveniently close to all the amenities of the city of Toronto within just a quick subway ride. Symbolically, HOMEOSTASIS represents both the personal yearning for and the right to shelter and protection. The sculpture stands tall and solid and yet its leaning stance and wind-sensitive wavering gives it a tentative and uncertain sensation. The sparse use of material does not take away from its solidity but gives it transparency and interaction with its surroundings and the use of primary colours gives it visibility and playfulness. As its namesake, this construction is caught in the act of maintaining equilibrium suggestive of the juggling act of every individual and family trying to make a comfortable living in a community close to the largest city in the country; it is also symbolic of the constant balancing act between the built and the open green environment. HOMEOSTASIS will be installed in the water pool in Mel Lastman Square. Visit any time between July 2 and August 24. 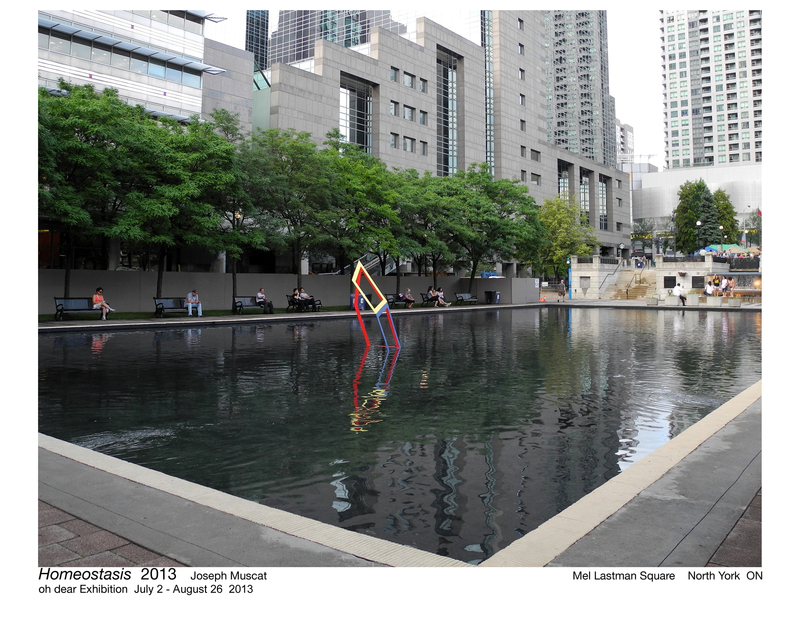 Thanks to the City of Toronto's Mel Lastman Square and the office of Councillor Filion for hosting this installation. Joseph Muscat's work is diverse; it includes painting, mixed-media, serigraphy, lithography, photography, experimental video and three-dimensional construction. He is Chair of Propellor Centre for the Visual Arts, a Director on the board of the Toronto Outdoor Art Exhibition, a founding member of Le Labo d'art and an associate of Padejo Art Collective. He is represented by the David Kaye Gallery in Toronto, Shayna Laing Art International in Montreal and Danielle Wohl Fine Art, Palo Alto, california. For Oh Dear, Joseph returns to the archetypal house image that has dominated his practice over the years. 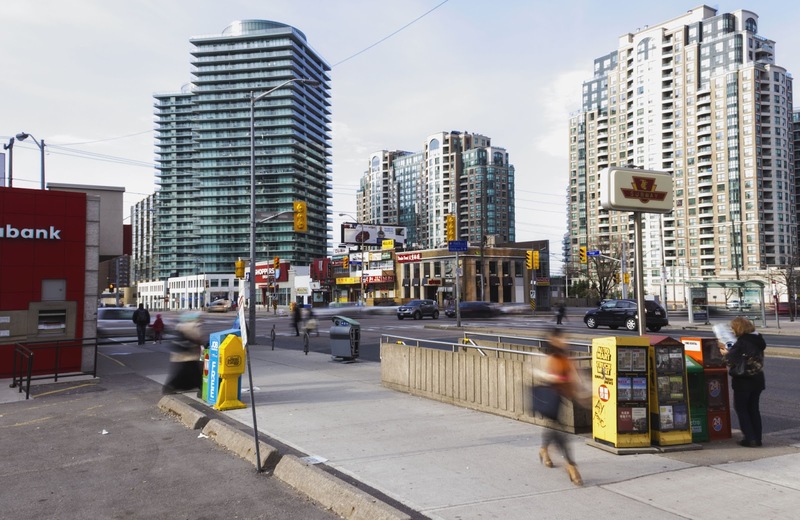 What do you think your neighbourhood will look like in 10 years? How about 50 years? 100 years? Tell us what you think about Paul Hong's short story and what you imagine your neighbourhood will be like in the future. "Hello, please provide your name and unit number." "Erin and I'm in unit 7905." "Hi Erin. How may I help you?" "I think this building is haunted." "Erin, if we understand you correctly, you're telling us that the Shepard-York Tower 19 is haunted?" "Can you elaborate on your assertion. For example, why do you think the Shepard-York Tower 19 is haunted?" "The basement is haunted. The bike room to be specific. I saw a ghost there." "We are concerned with your well-being and we'd like to hear more but perhaps you could send us an e-mail. The following --"
"No, I don't want to send an e-mail or leave a message. I want you guys to address this now. I can't live in a building that's haunted." "Erin, the Shepard-York Towers has one of the highest safety and satisfaction ratings amongst high density housing solutions in the new GTA and --"
"Okay, Erin, tell us why you believe the basement of Shepard-York Tower 19 is, in your words, haunted?" "I just started a new job and the subway commute is horrible." "The new LRT system endorsed by mayoral candidate Mefistofele Ming will ease congestion by at least thirty-three percent. If you'd like to find out more --"
"No, I want to tell you about the ghost. I don't want to hear about Mung." "Mefistofele Ming is the official mayoral candidate endorsed by the Shepard-York consortium." "So today I thought I'd try biking to York. They have those lanes and I figured might as well." "So I went down to the bike room and get my bike and see that it's flat." "Did you notify maintenance services? For an extra ten dollars a month --"
"Yes, I called them and they told me another one would be unlocked for me." "That's the appropriate course of action." "So I get another one and I'm getting it out when I notice there's someone else in the room with me. Of course, there was no one in there when I came in. I mean, I would've noticed some guy in white just standing there when I came in." "Was he standing by the door?" "No, the other side. Standing against the far wall. I thought, could it be possible I somehow didn't see this guy. So I basically ignore him and then look at him again and realize he's dressed entirely in white. White shirt, white trousers, white socks and shoes. He's even got a big white sun hat. It's all really old fashioned looking, too. You know the way the pants come up to here and are really baggy and all the buttons. At this point, I'm a little freaked out and thinking I should finish up and leave. But this guy is still standing there staring straight ahead like I wasn't even there." "How old was this man?" "He was an old guy in his sixties probably. Even though --"
"He wasn't doing anything? Was he a resident of the Shepard-York towers?" "No, he wasn't doing anything and he clearly didn't belong." "But how do you know he was a ghost?" "Well, let me finish the story and I'll tell you." "So, I'm freaked out and I'm getting out. I put my bike back and I didn't even lock it up again. I start heading out when he suddenly moves. He sorta bends down like he's going to pick up something from the ground but all the while looking straight ahead to see something. At that point, I said enough of that and got out of there and ran to the elevator and went up to my place." "Tell them what? I saw a ghost? No, I didn't say anything but I'm still kind of freaked out about it. I'm not going back down there now." "We will access security cameras now. Please wait. It seems you are right. There was another person in the room with you and it does seem like he appeared out of nowhere." "We will look into this." "Please keep this to yourself until we have ascertained the nature --"
"I already told my sister." "Your sister who lives in Shepard-York Tower 26?" "We will send her a notice as well." "To keep this quiet. It would be best to say nothing about it until after the investigation." "What are you guys going to do?" "Are you going to find out who the ghost is?" "We will let you know once we concluded our investigation." "I heard that this used to be a cemetery. That's why they built all these towers here because this used to be a cemetery." "Thank you, Erin. We will get back to you." The line went dead. After a moment, Erin called her sister. "I told them about what you said." "The thing about how all this used to be a cemetery." Ellen sighed. "I told you to keep quiet about that. I'm not supposed to know that. Damn it, Erin, why'd you open your mouth about that to them of all people?" "I didn't tell them you told me." "I wouldn't be surprised if you start having mysterious water problems or your heating goes kaput in the middle of winter --"
"Just because of some rumour?" "It's not a rumour. We live on what used to be a cemetery. They cleared it about sixty years ago and kept it quiet. People were paid off, the rest were just pissed off but they couldn't do anything." "But they moved all the bodies, right?" "I don't know. Seems kind of awful, if they didn't. Anyway, the point is it's all hushed up stuff and you go blabbing it to management of all people." "What do you think they're going to do to me? You're being paranoid. All I saw was a freaking ghost of some guy in white and now you think management is --"
"You shouldn't underestimate what management is capable of." "It was just a ghost," Erin mumbled. "I wonder who it was." "Some old timer who was buried here, I guess. He looked the part, that's for sure." "What was he doing?" Ellen asked. "I don't know but there was something weird that I didn't really mention to --"
Erin paused and then continued, "He was kind of bending forward before he disappeared but I think he was bending over because he had just thrown something underhanded." "I think he was bowling." "Yeah, it didn't occur to me then but it looked like he was bowling." Paul Hong is a Toronto-based author and librarian. 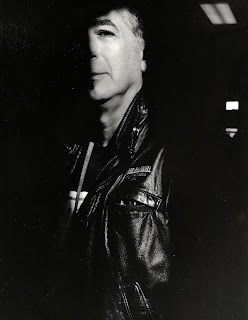 His short stories have appeared in a number of Canadian literary and art journals. He is the author of Your love is murder or the case of the mangled pie (Tightrope Books). Living and working in North York has afforded me the opportunity to draw inspiration from a constantly changing, incredibly diverse but entirely homely landscape. Only in North York can one turn a corner in the splendid peace of suburbia and find themselves suddenly in a bustling metropolis, only to turn another and enter into a silent wooded haven. Nestled away behind the upward sprawl of ever growing condo developments, Gibson House Museum perfectly represents the multiplicity of North York. 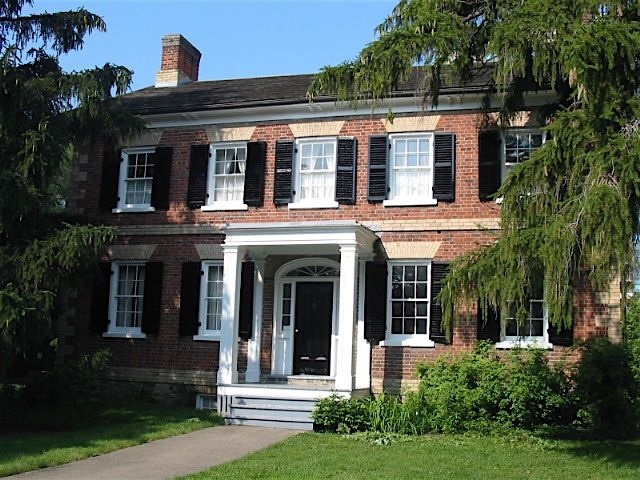 Turning from the hustle and bustle of Yonge Street one finds themselves in the peace and tranquility of the house of an early Toronto surveyor. I hope to portray this sense of duality in my work, as a viewer negotiates a new space on the familiar landscape of a flat canvas. In the various configurations of both installation and painting, this new body of work places the viewer in an ever-changing state of observation oscillating between an occupiable space and the flat canvas. I construct these elastic images by combining colours derived from contemporary interior design trends with a single, pared down image of a perspectival space. While the work is generally intuitively appealing, it also easily elicits opposite responses from resentment or those of bliss. My work is intentionally divisive in this regard. The viewer can remain engaged with the flat surface of the canvas or choose to decipher the image’s depth. Ideally, the work hovers and oscillates between these contrasting modes of reception. Bailey's installations are on view both inside the Gibson House Museum, and outside. Visit the work inside the Museum during regular Museum hours; the work outside on the hoarding directly in front of the Museum is viewable any time between July 2 and August 26, 2013. 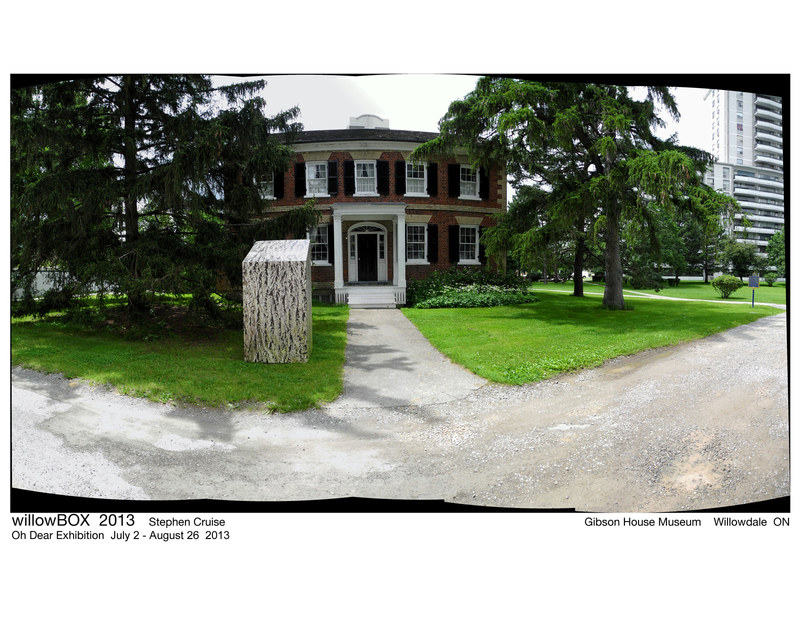 Thanks to the City of Toronto's Gibson House Museum for hosting and supporting these installations. Bailey Govier specializes in abstract painting. With close attention to space and colour, her flat, bold paintings challenge the viewer to perceive shifts in atmospheric light and volume. 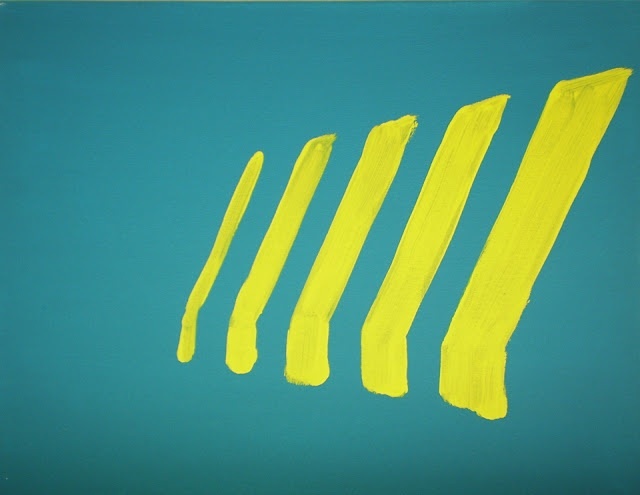 Her work is both site informed and contributes to architectural discourse via her contemporary painting approach. Govier currently resides in North York where she continues her studio practice. Reconsidering the space of North York as a topographical plan into a transformed aesthetic, Govier will highlight a site-specific location by informing its current architecture with new forms – both self contained paintings situated in the arena of revitalized abstraction and in the form of in-situ wall works transcribing her paintings directly in the space of receivership. Evolved from the embrace of my town’s name: W i l l o w d a l e, an identity not as widely known or acknowledged today as in days past due to the merging of communities and area boundaries. The Gibson House site provides the opportunity to explore histories present and bring the work home by addressing the perimeters of the Oh Dear project. Not only Ontario’s first land surveyor but also an early farmer and member of parliament, David Gibson opened the first district post office just north of the present day museum and gave it the name of ‘Willow Dale’ (after the abundance of willow trees in the area). This soon identified the town that emerged as well as give designation to the surrounding area. 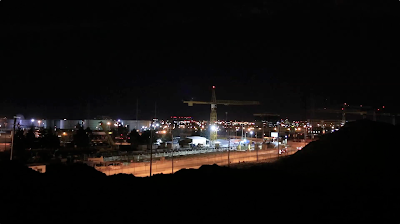 The translated work is a homage to this early community and addresses the strong residing impact of place, neighbourhood and citizenry that engage our present day-to-day. … a box is delivered as a device to evoke a sentiment, drawing upon narratives within a current diverse resident. … letters\notes received offer exchange of residing histories with layerings of present-day thoughts and needs. Stephen Cruise's willow BOX will be on the grounds of the Gibson House Museum and a second box location for mailing postcards is located at the North York Central Library from July 2 - August 26, 2013. 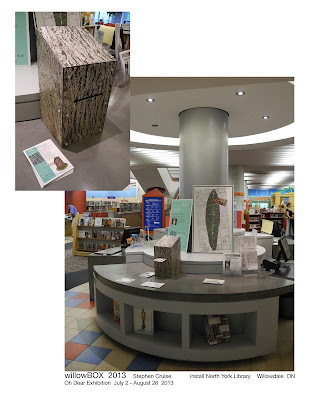 Thanks to Gibson House Museum and the North York Central Library for hosting and supporting this installation. Stephen Cruise lives and works in Willowdale. 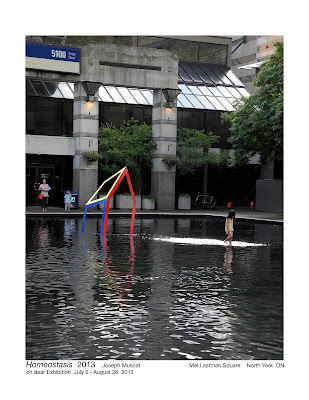 Selected public art commissions: gathering of a same time 2011, Downsview; Familia 2011, Port Credit; indigena domain 2008, City Hall, Cambridge, ON; a Path a Muse taken 2004, Trudeau Memorial Garden, Toronto (as yet to be realized); Vessel 2002, Manulife Rec. Centre, Waterloo, ON; after/before 2002, Don Mills Station, Sheppard Subway, Toronto; Places in a book (6 chapters) 1997, Spadina LRT, Pole Colonnade, Toronto (Sussex to Wilcocks St.), and the locally popular public art work One hundred links – one chain located next to the Gibson House Museum. Stephen will install a work that further explores his personal definition of edge city - from an abiding remembrance in a once rural Thornhill to his 80’s move ‘North of the 401’ to Willowdale. paola poletto and all the artists. Simple theme. Powered by Blogger.